Grand Island, New York - CyberBuffalo Biggest Fresh Water Island? There are 19 islands in the Niagara River between Lake Erie and Niagara Falls. One of them is famous. The whole world knows of Goat Island. It perches on the crest of Niagara falls. Grand Island can be seen from the Buffalo City Hall observation deck. This one is larger than all the others combined. 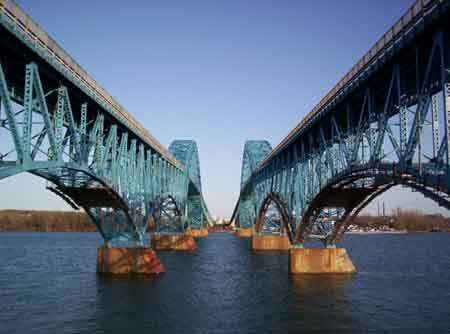 Grand Island being comparatively unknown is surrounded by the highly industrialized Niagara Frontier. More than a million people live within 7 Mile band across the river from its eastern shore. What lake is the largest freshwater lake in the world? Back in 1935 the Niagara River cut off Grand Island from the mainland. Ferries were the only means of transportation. And the Niagara River at times is no place for a ferry. Grand Island is about 5 square miles larger than Manhattan. It is some 8 miles long and 6 miles wide at the widest point. With an average width of 4 and 1/2 miles. The claim has been, that it is the largest freshwater island in the world but a glance at any map of the Great Lakes will disprove this. Manitoulin Island is actually the largest freshwater island in the world. It’s on the great lakes as well. Manitoulin Island is on Lake Huron near Georgia Bay. The Erie Canal enters the East River at Tonawanda. It follows a 20-foot dredge channel to the locks at Black Rock and terminates at Buffalo NY. There is also a 12-foot dredged Channel running North from Tonawanda to Niagara Falls. The island is partially wooded. Its surfaces are generally level with about only 20 feet difference between the highest and lowest points. There are Two closely attached Islands. Beaver Island is at the South side. Buckhorn Island is at the North side. Both are now state parks, while motor Island (formerly frog Island) in East River is privately owned. Grand Island is a town of Erie County. It has its own town government, its own school system, water districts churches and Commercial establishments. There is no heavy industry. Its industry is of the light manufacturing and laboratory type. It engages largely in research and development. Grand Island’s climate is invigorating. The Niagara River acts as a natural air conditioning system. It keeps the island warmer in the winter and cooler in the summer.